We all have refrigerators with freezers attached to them, and they are okay. Let's face it though, there is not enough space. That is why the Frigidaire FFFH17F2QW is so great. This freezer guarantees you will no longer have to play Tetris with the frozen goods in your primary freezer. How Does the Frigidaire FFFH17F2QW Compare to Other Brands? Instead, you can place your overflow in the Frigidaire. That's good news for those of you have passed up great deals because you don't want to sacrifice your meat for the Hungry Man meals. As exciting as it is to have more space, however, purchasing a freezer is a big deal. You need to make sure you have all of the facts about not just the freezer you want, but others like it before you shell out hundreds of dollars. The Frigidaire FFFH17F2QW is an outstanding upright freezer. The model has great features and excellent reviews. By and large, customers who have purchased one love it and it is no wonder when you find out what it has to offer. 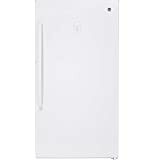 The Frigidaire FFFH17F2QW is a 16.6 cubic foot upright freezer. The Adjustable Temperature Control on the freezer helps your food stay fresh. This Frigidaire model also has a frost-free feature that ensures that you will never have to defrost freezer again. It also has four wire shelves, six door racks, an LED light, and a safety lock with a pop-out key. The Frigidaire is also Energy Star rated. Take caution if most of your frozen goods are in your freezer for the long haul when using any frost-free freezer or setting. Frost-free means that the temperature fluctuates, though staying at "freezing," and that can shorten the lifespan of your frozen goods. The great thing about the Frigidaire FFFH17F2QW is that it is relatively affordable. You can purchase it on Amazon. Most of the customers who have rated this freezer love it. On Home Depot's website, the Frigidaire model has 4.6 out of 5 stars and 95 percent of the people who have purchased it say they would recommend it. LennyJr from Slidell, Lousiana gave the freezer five stars and said, "My best purchase for an upright freezer." On Lowes' website, consumers are just as happy as those who bought their freezer from Home Depot. The Frigidaire has a rating of 4.5 out of 5 stars. A customer calling himself Tbill exclaimed that the freezer was a "great buy!" and said,"This is a great freezer for the money--Energy Star rated, adequate capacity, excellent layout with shelving and pull-out baskets." Some customers were less than thrilled, we will explain why below, but overall people who bought the freezer were very happy. There are some other freezers that are comparable to the Frigidaire FFFH17F2QW. Most notably, the Maytag MZF34X16DW, GE FUF17SMRWW, and Whirlpool WZF79R20DW are the of the most closely related freezers. All three of these freezers have features that are similar to the Frigidaire and range in prices. The first freezer we are going to check out is the GE FUF17DLRWW. That is a 17.3 cubic foot, upright freezer. It is a little bit larger than the Frigidaire but has very similar features. For instance, like the Frigidaire, the GE has a frost-free feature that prevents ice from building up on the inside of the freezer. It also has an LED light that makes it easy to find items in a room with dim lighting or if you are digging around in it for a midnight snack. Finally, it comes with a lock and key too. Unlike the Frigidaire, though, the GE model has an audible freezer alarm that alerts you if the door is left open and the temperature rises. It prevents food spoilage. The freezer also Turbo Freeze. This feature blasts your food with an extra boost of cold air to restore the freezer's temperature and keeps your food safe. The second freezer we are going to compare to the Frigidaire is the Maytag MZF34X16DW. This is a smaller freezer than the Frigidaire model at just 15.7 cubic feet of storage. However, it comes with some fairly nice features. Like the Frigidaire, the Maytag has a frost-free feature and LED light. The freezer also has decent storage with three adjustable, full-width wire shelves and one freezer flood shelf. The Maytag also has easy to use temperature controls that allow you to set the freezer's temperature to exactly what you want it to be. Unlike the Frigidaire, the Maytag has a reversible door that allows you to open it from the left or the right so that it fits into almost every space. The Maytag also has pretty fantastic ratings on Home Depot's website with 4.5 out of 5 stars. According to reviews on the site, 93 percent of the people who bought it would recommend it to other people. However, there are some complaints. Some customers have said that the door does not seal well and others said ice builds up inside of it. The last freezer we are going to compare to the Frigidaire FFFH17F2QW is the Whirlpool WZF79R20DW. The Whirlpool is the biggest freezer we looked at with 19.7 cubic feet of storage. While it may be bigger than the Frigidaire, it has some of the same features. For instance, it has the frost-free feature that prevents ice build-up. It has a LED light and easy to use temperature adjustments. Unlike the Frigidaire, however, the freezer has an alarm that alerts you if the temperature drops to a dangerous level. The freezer has a wire basket, gallon door bin, ice cream compartment, pizza pocket and two adjustable half-width door shelves. Perhaps the coolest thing this freezer offers is an optional icemaker that you can buy separately. The Whirlpool freezer has a 4.7 out of 5-star rating on Home Depot's website. While 95 percent of the people who reviewed the item said they would buy it, there have been some complaints. One person complained the freezer was poorly designed. As mentioned, this freezer is the biggest of the bunch, and it is also the most expensive. If you are in the market for a new freezer, the Frigidaire FFFH17F2QW is definitely worth taking a look at. It has a decent amount of space, nice shelving, and a lot of other great fea​​tures. Ultimately, it will be up to you to decide if you just want a basic freezer with great storage like the Frigidaire for a lower price or something with all the bells and whistles like the Whirlpool. Both of those are great, it just depends on what fits in your budget. Overall, the Frigidaire FFFH17F2QW is a good buy. 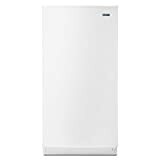 The size and space is amazing and the price is generally affordable for a big appliance.